This section hasn't been moved yet. Most amusement parks, trolley parks and boardwalks had dance halls. During the summer, these buildings hosted bands nearly every night of the week. Many resorts and picnic groves also held weekly dances at their outdoor dance pavilions. In the city, large hotels had fancy ballrooms on their top floors. 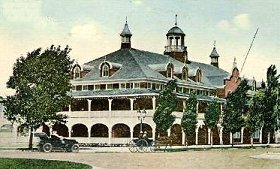 Country clubs also had ballrooms, which were ideal for hosting debutante dances and charity balls. In town, you could often find a small ballroom in the local Odd Fellows Hall. Drinking establishments of all kinds could be found in the 1910s. Some were legal, others were not. During this decade, many areas banned the sale of alcoholic beverages by enacting dry laws. Any business that sold alcohol without a license or in defiance of these laws was known as a blind pig. hotel bars: In the city, many large hotels included a Men's Bar for the enjoyment of their male guests. The decor was opulent and decidedly masculine, with dark colors, plush carpets, polished woodwork and risque paintings on the wall. Men gathered to have a few drinks, smoke cigars, play billiards or poker, and relax in an atmosphere free of female influence. beer gardens: Many parks had outdoor areas where both men and women could gather for drinking, socializing, and perhaps some dancing. 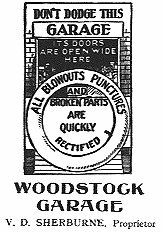 saloons: Smaller drinking places had wooden bars, foot rails, spitoons on the floor, and plate glass windows with curtains drawn across. 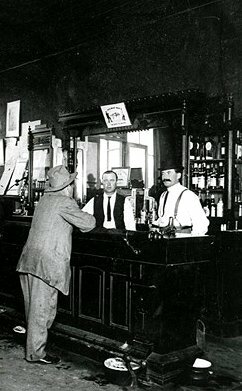 Customers were often required to stand at the bar because local ordinances prohibited the use of tables, chairs and stools in saloons. rural taverns: Out in the country, many gathering places were located in remote hotels and ramshackle buildings along the river. These nightspots tended to host more illegal activities, since it was harder for the police to monitor them. Alcohol was frequently sold without a license, and patrons often engaged in illegal gambling activities such as slot machines, dice games and betting on cockfights. juke joints: In the rural south, these establishments provided a place for black people to gather for drinking, dancing and gambling. The buildings were often just one step away from total collapse, but the music was good and the company was even better. 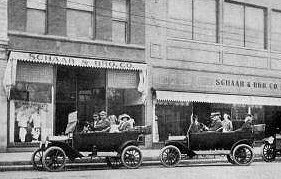 In the 1910s, most automobiles were unsuitable for winter driving. 90 percent of all cars were open to the air, and heaters were not standard equipment. It was common for car owners to "put their cars up" for the winter. 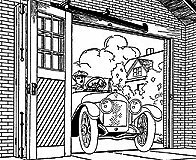 If they didn't have their own garage, they rented a stall in a barn or commercial garage and put the car up on blocks to protect the tires. Ice was delivered regularly throughout the year. When you needed ice for the icebox, a window card told the ice man how much to bring in when he came around. Each ice company used a different colored card, which specified the amount of ice by weight or price. Coal was also delivered to the home. Families with coal-burning stoves or furnaces placed their orders with the coal dealer in the fall. Coal was loaded into the cellar by placing a coal chute in the cellar window. In northern areas, ice was harvested from rivers, lakes and large ponds. Each winter, ice companies operated for approximately two to six weeks and provided employment for up to 250 men. These men stayed in local boardinghouses and visited local taverns, which helped bolster the town's economy. 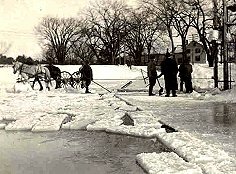 At harvest time, the ice was cleaned with horse-drawn scrapers and scored into large blocks. Ice saws were used to cut the ice into rafts of 20 blocks each, which were towed by horses to the conveyor belt. Here, they were cut into individual blocks and were sent up the conveyor belt to be stored in gigantic ice houses. A railroad spur led to the ice house, where blocks of ice were loaded into insulated boxcars for shipment to the city. Communities with more than 2,500 residents are considered urban. In the 1910s, the number of people living in urban areas increased from 46 percent of the population to 51 percent. The Woolworth Building opened in New York City in 1913. It was the world's tallest building, with 55 stories, 30 elevators and its own power plant. The lobby was quite lavish, with marble floors, fine sculptures and a stained-glass dome. The Woolworth Company occupied two floors and rented out the rest. Prior to this, the world's tallest building was the 51-story Metropolitan Life Insurance Company building, which was also located in New York and was completed in 1909. The problems created by increasingly taller and bulkier skyscrapers were becoming more evident. 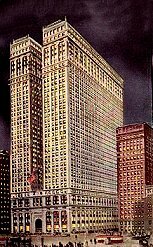 In 1916, New York City passed the first skyscraper zoning law. This law required that tall buildings be scaled back in a stairstep fashion after reaching certain heights. This would increase the amount of light and air to reach street level. Click here for more sights from the city! This skyscraper was built in 1915 on the site of the old Equitable Life Assurance building, which burned down in 1912. Notice how the sides go straight up....it was the last building to be constructed before the 1916 zoning laws went into effect. The hitching ring was the answer. For decades, these metal rings had been used on decorative posts in residential areas. Now they were embedded in the concrete sidewalks and curbs downtown. This allowed a town to adopt a modern appearance while providing a place for farmers to hitch up their horses. My town installed hitching rings in 1912 when the town square was paved with brick. The train yard was a maze of railroad tracks and rail sidings. 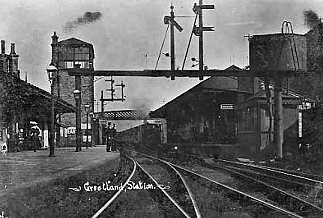 Lumber yards, coal bins, ice companies, mills and grain elevators were located near the depot and were each served by their own spur track. A suburb is any community that is connected to a city. 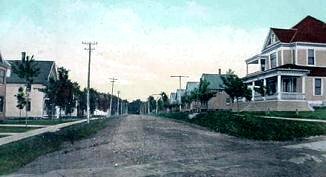 The earliest suburbs were formed in the 1800s when wealthy families built country homes in rural areas just beyond the city limits. In the mid 1800s, railroad suburbs were created when the first rail lines radiated out from the city center. Beginning in the 1890s, streetcar suburbs were located where the streetcar lines met the city limits. Many of these communities were laid out in an orderly pattern before the homes were built, and were advertised as the perfect combination of city and country living. As the city limits expanded outwards, the suburbs were pushed farther and farther away from the city center. By the 1910s, the earliest streetcar suburbs no longer existed; they had been overtaken by the city and were now part of it. A brand new type of suburb began to appear in the 1900s. Known as automobile suburbs, they were located miles away from the trolley lines and were accessible by auto only. These communities were settled by middle class families who had the financial means to build homes in the country. Because they owned motor cars, they didn't depend on trains and trolleys for transportation. Click here for more town views! The urbanization of America continued, and in the 1910s we passed the halfway point. During this decade, the percentage of Americans who lived on farms or in rural areas dropped from 54 percent to 49 percent. The greatest population shift occurred immediately after the war, when young men returning from the front decided to move to the cities they had seen and heard about during their wartime travels. The migration of African Americans to northern cities was also launched in earnest after the war. The threshing process separates the wheat grain kernels from the stalks. In the 1910s, this operation was performed by large machines known as threshers. Threshing was a big job, and the machines were too expensive for individual farmers to own. At threshing time, groups of farmers pooled their resources to rent a thresher. They helped each other, doing a different farm each day until the job was done. Click here for more country life! Farm life was in a state of transition during the 1910s. This was due primarily to technology. Technology was making the farmer's job easier, but it was also beginning to crowd out small family farms in favor of large corporate farms. Gasoline and electricity were beginning to change the nature of farm work. Modern farms used gasoline-powered tractors, threshers and combines. Electricity was used to power water pumps, incubators and milking machines. In 1910, 2 percent of American farms were either wired for electricity or generated their own. Most farms continued to do things the old-fashioned way. 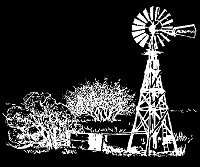 Their tractors and threshers were powered by steam, their incubators were powered by kerosene, and their water pumps were powered by windmills.